What is The Best Video Format to Choose for YouTube/Editing/TV? Support almost all the popular video formats. There are truly a lot of formats used in saving video and this can be quite confusing on your part. Other formats are known to be optimal for capturing the videos while others are used for editing workflow. Apart from it, there are also video formats that are utilized in the distribution and delivery of video. 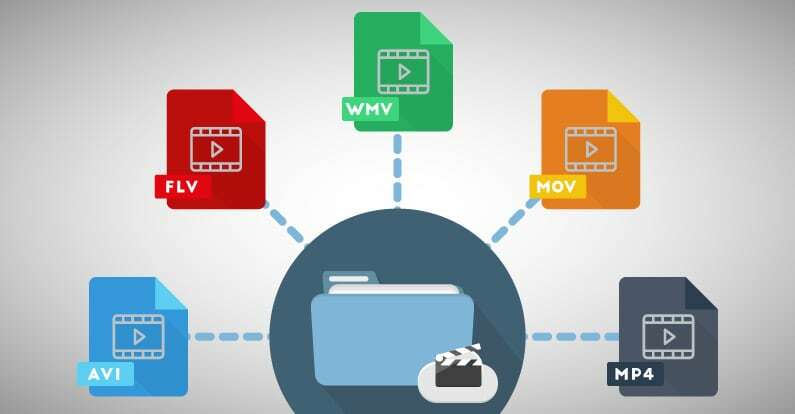 In this article, you will learn more about what video formats is, various video file format types and how to choose the best video format based on your needs. You may also like: What is Frame Rate and which one to choose? Video file formats refer to the type of file format that storing digital video data on a computer. Just as you’re dealing with a video, it is best to understand that a huge amount of data will be required in depicting a video signal. The information will be compressed and will also be written into a file. Normally, a video file in digital format consists of two parts, a codec, and a container. A codec will compress the video so it can be played and stored. The most common codec is H.264, which is usually used in HD videos. A container is like a box which contains the video, audio, and metadata. In most case, people regard it as a file extension because it is often recognized in file names, such as AVI, MOV, MP4, or 3GP. Due to the availability of cross-platform of Flash video players, this format has even become more popular. In fact, the flash videos can be played in different Flash movies files. These are entirely supported by each browser on each platform. The best thing about these flash videos is that they support both streaming and progressive downloads. FLV video format is encoded by Adobe Flash software which can be played via Adobe Flash Player, web browser plugins and some third party programs. However, Apple’s iOS devices and many other mobile devices, do not support the Flash Player plugin. AVI format is created by Microsoft and it is one of the oldest video format. This format effectively stores data to be encoded in different codec’s, which also contains both video and audio data. In this format, you will notice that it utilizes less compression as compared to other similar formats. Though it is developed by Microsoft, the AVI files can be run on different operation systems such as Windows, Macintosh and Linux. Besides, this format can be encoded in different codecs and it is supported by most popular web browsers. It is also one of the famous formats used by internet users. MP4 is an abbreviation term of MPEG-4 Part 14, which is developed by Motion Pictures Expert Group. It is used in storing visual and audio streams online. It mainly utilizes a separate compression intended for video and audio tracks. The video format will be compressed using the MPEG-4 video encoding. MP4 format is getting more popular than FLV for online video sharing, since it is compatible with both mobile and online browsers and supported by the new HTML 5 technology. What’s more, the videos size of MP4 format is relatively smaller and the video quality will remain high even you compress it. WMV is developed by Microsoft for web streaming at first to against RealVideo format. It is the smallest video file on the web because the video size will be reduced after compression by sacrificing the video quality. However, the WMV video format can be used in email system (maybe the only video format). Since it is developed by Microsoft, you can play the WMV format video with the Windows Media Player, but you can also play it on Macintosh computer by downloading WMV players. This video format is developed by Apple, which is a popular video format for Macintosh users to share and view videos. This is likewise used for saving video and movie files on the internet. This also contains a single or multiple tracks that store audio, text, video and effects. Though it is developed by Apple, .MOV can also be made compatible with Windows Platform since there is a free version of QuickTime Player available for Windows. While high quality MOV video will have bigger file size. Standardized by the famous MPEG, this video format is used to create downloadable movies. This 3GP format is designed for transmitting video and audio files between the internet and 3G cell phones. This mainly serves its purpose of streaming videos at low bandwidths. You may already be researching over the web and asking your friends about it. Good thing, below is some information that you would ever want to consider. It is important for you to choose MP4, FLV, MOV or AVI as your sharing format. This is actually best for online video platforms, specifically YouTube. If you also want, you can make use of MPEG or WMV and SWF. If you are uploading to video to Facebook or Instagram or the newly launched Instagram IGTV, and curious about the preferred best video formats for each social platform, below is the brief summary table. If the video you are editing will mainly be watched on HD TV or computers, it’s a good idea to export in formats with the highest quality. MOV, AVI, and MKV are good choices for that purpose. The only problem is that high quality videos usually takes up more spaces, so always make sure that your hard disk has enough spaces. As per the best format to choose to burn onto DVD, MPEG-2 can be your best option. This is also known as a container format and there is also a codec of the similar name. This is often called by people as H.262. This is basically intended to be used for DVD players. If the video you are making is for your website, it is best to choose to output using WEBM or HTML5. These two formats have small sizes, making them very easy to stream. So your customers won’t have to wait for too long when they watch it on your website. Note: In most cases, we recommend you use MP4 H.264 as it is currently the industry standard for HD videos. How to set Video Format in Filmora9? In Filmora9, you can save the video to most common video formats including WMV, MP4, MOV, F4V, MKV, TS, 3GP, WEBM, GIF, MPEG-2 or just save the video to MP3 format. For uploading a video to YouTube, you need to know the format requirements. The formats you are allowed to upload videos include MOV, MPEG4, MP4, AVI, WMV, MPEGPS, FLV, 3GPP, WebM, DNxHR, ProRes, CineForm and HEVC (h265). If you don't know which format you want to use, you can always use MP4 format as it is a common format that is compatible well with many devices. You can use aspect ratios 4:3 or 16:9 to upload YouTube video. You should know that for 4:3 video, it will be added black letterbox bars automatically after uploading it to YouTube. You can upload video up to 15 minutes to YouTube. You need to verify your YouTube account if you want to upload longer videos. You need to go to this verification page to fill out all information. After it is done, you can upload longer video, but you are not allowed to upload video larger than 128G. For uploading VR video, the aspect ratio should be 1:1. The resolution ranges from 5120 x 5120 to 8192 x 8192. It is recommended that you should use horizontal video in case of having black letterbox. If you still have some questions about how to choose the best YouTube video formats based on your need, or you want to share some ideas of video format for different platforms, please leave a comment below. Does it happen after you dropping the video to the timeline? If there is no problem with the source files, I assume it is caused by the compression of the preview window. Actually, after you load the video to the timeline, it will be compressed to a lower resolution for fast rendering speed. (Most programs will take this action). Normally, the output quality will not be affected. You can export your file to check it. Have you tried to export it to other formats? Is it synchronized? 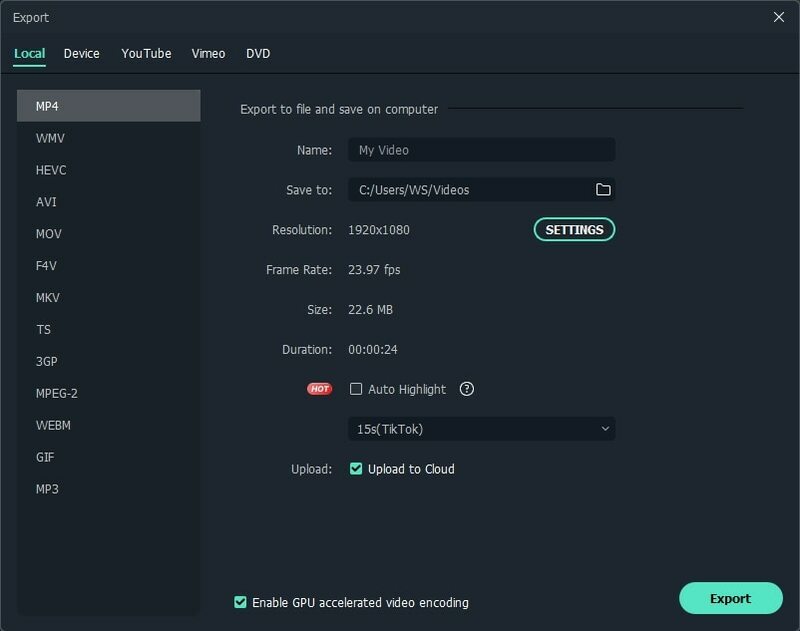 I have found some information on the website: https://filmora.wondershare.com/faq/exporting/#how to maintain the output video quality You can also contact the Filmora support team to get the professional help. For some reason every time I finish editing and exporting. I find the video that I just e using AVI not synchronized!!!!! I don't know what's going on please help !!! i keep exporting again and again and it's getting worst ! Why when i'd imported video with avi format, the video's resolution change? It became oblique and broken. Could you give me solution?